Thirty five Golf courses and 3 football pitches in the UK are developing large yellow patches that may signal the beginnings of a spread of a new pest within the UK. The patches are created by microscopic worms called nematodes (Meloidogyne minor see CSL 2007 Risk Assessment)which attack the roots of the grass species used for lawns & pitches, weakening the plants and causing the sickly patches. So far there are no known effective control measures and there is a small but real risk that the pest will be spread by golfers on their footwear to more of the existing 2600 golf courses in the UK with little chance of prevention. Currently, it appears that M. minor is indigenous to the UK, although similar cases have been seen in the Netherlands. 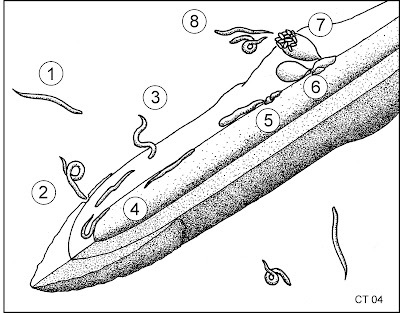 I was first made aware of this information when I visited Dr Amanda Cottage at NIAB where we reminisced about our past interest in the field of nematolode resistance when I was still a scientist. Amanda is now a Plant Pathologist at NIAB, with responsibility for developing assays for new and existing diseases in mainly broadleaved plants. NIAB has a long tradition of trialling and testing for a variety of clients, from farmers to the Potato board. With the increasing importance of rapid pest identification for UK agriculture and the need for faster responses, there is a necessity for the development of assays using the newest molecular techniques. Angela's experience at the cutting edge of plant molecular research will be a key factor to developing this area for NIAB.